FLEETWOOD MAC MANIA is a stunning visual and musical tribute to Fleetwood Mac. Each veteran player in this world class tribute band brings their spirit to re-create with incredible accuracy, the look and feel of Fleetwood Mac and Stevie Nicks. The harmonies, instrumentation and on-stage chemistry has impressed and captivated audiences from coast-to-coast. 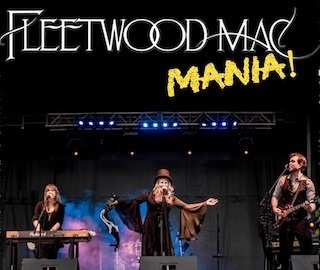 Fleetwood Mac Mania has earned the reputation of being the most authentic sounding Fleetwood Mac tribute band in North America, and have played for audiences of up to 18,000 people. ​The front line of Fleetwood Mac Mania captures the harmonies and chemistry of Stevie Nicks, Christine McVie and Lindsey Buckingham that made Fleetwood Mac one of the most successful bands of our time. Incredible percussionist/drummer holds down the signature Mick Fleetwood style and sound. Friday, January 4, 2019 • 7:30 P.M.